The forest is mainly savannah covered with tall elephant grasses. The main attraction of the National Park is Asiatic one-horned rhinoceros. 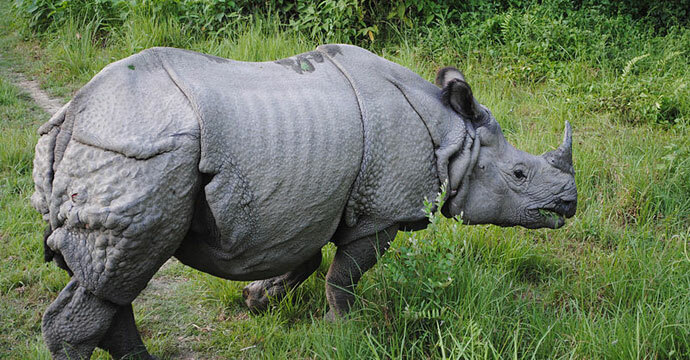 The national park holds the maximum number of rhinos population in India after Kajiranga National Park in Assam. The other animals consists of Royal Bengal Tigers, elephants, deers, sambhar, barking deer, spotted deer and hog deer, wild pig, bisons. Jaldapara is a paradise for bird watchers. It is one of the very few places in India, where the Bengal Florican is sighted. The other birds to be found here are the Crested Eagle, Pallas's Fishing Eagle and shikra, besides Jungle fowl, peafowl, patridges, Bengal Florican and lesser Pied Hornbill. Python, monitor lizards, krates, cobras, geckos and about 8 species of fresh water turtles have also found national park here. An adventurous elephant ride in the morning will take you deep inside the grassland for the real excitement. The sights of rhino in a muddy pond, the herd of elephants or the running deer are the thrilling experiences in Jaldapara. Toto Para, adjacent to the national park is another major attraction for those interested in ethnic tourism. Toto Para is the only settlement for the Toto Tribe, one of the most endangered ethnic communities in the world. Their numbers are now reduced to mere a thousand. Lot of initiatives has been taken by the governmental and non-governmental agencies for the uplifting their living condition. However, to live with them and to observe their traditional cultures can still be a precious experience. Hidden deep inside the Chilapata Forests the ruins of a thousand years old fort of Nal King has a tremendous historical and archeological importance. The ruins consist of a broken wall and a broken gate of the fort. Built in the 5th century during the Gupta Empire the ruins still recall the memories of the Golden Age. Because the site is not maintained properly, it has now become the playground for leopards, snakes and other animals. However digging up the ruins to extract the unheard tunes of the past might destroy the present ecological balance of the forest. It is wise to leave it to the competent authorities to decide whether we should compromise the present and the future to gather the wisdom of the past. The forest also consits of a unique tree that bleeds like humans. The fluid that comes out is blood like in color and density. They are located just few meters outside the broken gate of the old fort. According to the locals of that area these trees are 100-200 years old and is not found anywhere in the world. These trees are only a few in number are yet to be given a botanical name. Tourists can find comfortable accommodation and delicious food right in the heart of the national park at the Hollong Forest Bungalow or the Jaldapara Tourist Lodge. Garumara also has a forest bungalow with two rooms in the most enchanting setting. Number of Rooms: 22 double bedded rooms,@ Rs.1000/- including all meals. 13 bedded dormitory @ Rs.300/- per bed including all meals and Rs.650/- per cottage with food. No. of rooms: (7) Seven Double Bedded rooms @ Rs.1000/- per room per day + Compulsory food @ Rs.175/- per head per day (dinner, breakfast & bed tea only). Lunch - Optional Rs.75/- per head.